I know it may seem hard to believe, but even after many excellent Newsbusters exposes of scandalous Tea Party media coverage (Noel Sheppard on Janeane Garofalo's attacks, CNN's selective Susan Roesgen coverage, and MSNBC's juvenile behavior; Warner Todd Huston on CNN cutting off e-mail access; Seton Motley on Susan Roesgen's conflict-of-interest vis-a-vis Fox; and much more) one instance of Tea Party media coverage that's either shockingly incompetent or record-breakingly biased has virtually gone overlooked. Overlooked, that is, except by Eric the Red on his Vocal Minority blog. Eric realized the NBC News affiliate in Washington, D.C. was running a left-wing spoof video of the D.C. 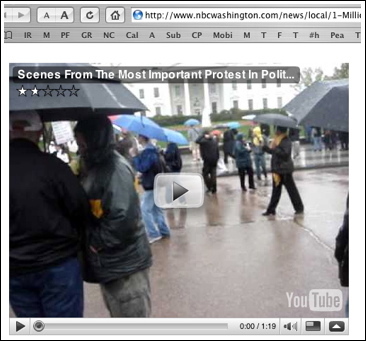 Tea Party on its website as if it were footage of the real thing. I say "spoof video," but it's really worse than that: It's a video shot by leftists of other leftists who, after trying and failing to infiltrate the D.C. Tea Party, moved elsewhere, chanting slogans like "tax work, not wealth" in an effort to falsely make Tea Party attendees look rich, callous and out-of-touch. It's not a spoof meant in fun, but a spoof meant to slander. And NBC either fell for it or is complicit. As bad as that is, the footage has now been running on the NBC affiliate's website for two days and as of the time of this post, has yet to be taken down. Eric has the video, or you can see it, as of this writing at least, on the D.C. NBC News affiliate's website here (it's the video mockingly entitled "Scenes From The Most Important Protest In Polit..."). The chants heard in this video are nothing like those one would expect at a genuine Tea Party, and NBC should have realized it. The idiots chanting were obviously counter protesters. What they were shouting had absolutely nothing to do with what the Tea Parties were about. Anyone with half a brain could recognize that. The leftists reportedly are part of a group called "Billionaires for Bush." The group tried to infiltrate the main D.C. Tea Party, but after Tea Party speaker Andrew Langer realized what was going on and told the crowd what the infiltrators were up to, the infiltrators moved about 300 feet distant on Pensylvania Avenue and began acting out and shooting the video later to be run by NBC. Andrew Langer has said today that this leftist effort was organized by a professional political organizer who is a $2,700 Obama contributor. While Obama voters are said to have particpated in Tea Parties from coast-to-coast, NBC may have found the only $2,700 Obama contributor to get anywhere near a Tea Party. Too bad NBC didn't label the Billionaires for Bush spoof for what it was: a modern-day YouTube version of an old-fashioned political dirty trick, and -- except perhaps for NBC's unwitting or witting complicity -- not a very well-done one at that. Cross-posted on Amy Ridenour's National Center Blog. Amy Ridenour is chairman of the National Center for Public Policy Research..